Welcome to the 2018 Boxing Day CAL...... I will get a description up soon, but wanted to get the thread open in case anyone is already started! 12/31/17 update: Hello, this is the Boxing Day CAL. Boxing Day is the day after Christmas and is a holiday in most of Great Britian and parts of Europe. When it originated, servants were given the day after Christmas off work. They were given a box of food and/or gifts to contribute to their delayed celebration of Christmas. Here in the Ville, the Boxing Day CAL has been around for quite some time. I have hosted for a few years now and have absolutely enjoyed seeing what everyone is making. We do not all contribute to any one charity...everyone just shares pictures and stories of what they are making for their local charity. The items going to charity do not have to be crocheted. I make beds and blankets from fleece for an animal rescue and we have had a gal that made walker and wheelchair totes. We chat about our triumphs and failures, and basically cheer everyone along. Well it has been a busy Boxing Day indeed. I was on a yarn diet but then Joann's had a HUGE instore yarn sale and I stocked up for my doll projects and the replaced the yarn I stole from my niece's graduation afghan to make doll clothes with last year. I had to explain to DH that while I have lots of yarn there are certain projects like the doll carriers and the doll blankets that require multiple skeins of the SAME color. Random colors just aren't helpful. On the bad news good news front I picked up 3 Springfield dolls for $20 using my AC Moore $10 rewards coupon. The bad news is the dolls are on clearance. AC Moore is bringing in a new doll line at a considerably higher $ starting point. DH is going to hit the stores near work to see if he can clear out their supply too. I can store what I can find. I did that with the Mary Maxim baby dolls when they were dumping the soft dolled 15" dolls. The last one went this year. I will have to decide what doll to move to as my supply will eventually run out. I've always done well at AC Moore as they kept the starting $ point at $19.99 and most years I've been able to use coupons and rewards certificates to keep my cost to a reasonable level. Bailey, the bunting is very sweet. I'm pretty sure there is a picture of each kid in my family all tucked in to one. Sorry to hear about the dolls. At least you have a little warning and some time to adjust. I saw the big yarn sale at Joanns. Luckily I have a very busy week and will probably not make it there! Or maybe?? Aaaah! Did a little more research when I got home it appears the Springfield line I've been buying for the last 10 years for this donation is being discontinued and being replaced by the BU-TIFUL dolls which are still $10 more than the base price for the Springfield dolls I have been buying but about $10 cheaper than the dolls I saw at AC Moore today that are replacing the Springfield dolls. When I run out of the Springfield another option might be the Our Generation dolls from Target. My niece had several of those years ago along with an American Girl and she liked them and the hair was considerable nicer than the Springfield dolls. They basic Our Generation dolls appear to be cheaper than the BU-TIFUL dolls and the line offered at AC Moore. There are 2 Targets in town here so that might make buying them easier as well. I don't know we'll have to see how it all plays out. I'd love to here any experiences people have had with the other lines of 18 inch dolls in the lower price range as price is a factor when trying to donate multiple dolls each year. Bailey, the baby bunting is very cute indeed. I will be making some charity items this year. Will try to remember to post them here. Finished the first 18" doll blanket of the year. Working on the trim for the second. I have plenty of yarn now I just have to decide if I go on to doll carriers or 18" doll clothes. We'll see what happens. My hands are a bit tight and working 3 strands of yarns for the carriers can be a bit wearing. We'll see how it all pans out. I have started a baby round ripple for Project Linus. I am knitting a baby sweater to donate to the local pregnancy resource center. I knit slowly though, it will take a while. Bailey4, your doll projects are so cute. Hope you can find a suitable, budget friendly doll for your projects. Had a great family dinner at SIL's house with DH's brother and parents. Brother is leaving for home tomorrow, the parents on Saturday, so it was nice to have a chance to get together before everyone heads home after their Christmas vacation. On the way home DH surprised me with a trip to the AC Moore close to where his sister lives and I found 5 more Springfield dolls on clearance. Sadly they are all the same blond Abby, it would nice to have some variety. However, I can't be choosy, I have to buy what I can get. They also had a coupon for $10 off $40 so pretax I got one doll for free, DH is going to check out the store near work, but this should give me some breathing room on having to find a new doll right away. As it stands now I have enough for 3-4 years depending on how many I donate each year. If I can pick up a few more I could stabilize it easily to 4 years and by then I may have found an affordable alternative that is actually a nicer doll. Well, my daughter gave me a $100 gift certificate for Herrschners this Christmas. So, I "invested" it in their Worsted 8 yarn (taking advantage of the end-of-the-year sale). I've used some in the past, and I wanted to try some new colors. I don't have any specific projects in the works just yet, but I'm always working on scrap afghans for Warm Up America. What better way to use up all these new colors I just ordered? We're doing a couple of hats for NICU babies programs at the library in January at my library. It's something I'd like to do a little more regularly. I love to see places like libraries organize and help get people motivated to work on these types of projects. Often people are interested but they just don't have the time to invest in figuring out what to make and how to get it there. Hi all, I had pneumonia for Christmas (I must have been on the naughty list) and then somehow an update on my computer lost my saved password...drama! Anyway, welcome back Cindy and do we actually have two Hollys? Welcome to you both! And welcome to Debbie! I started a C2C scarf and am surprised at how much yarn it takes up. I am almost done with a skein of yarn and the scarf isn't very long. I will post a picture later. Has anyone heard from Darski? I'm wondering how her hands are doing. 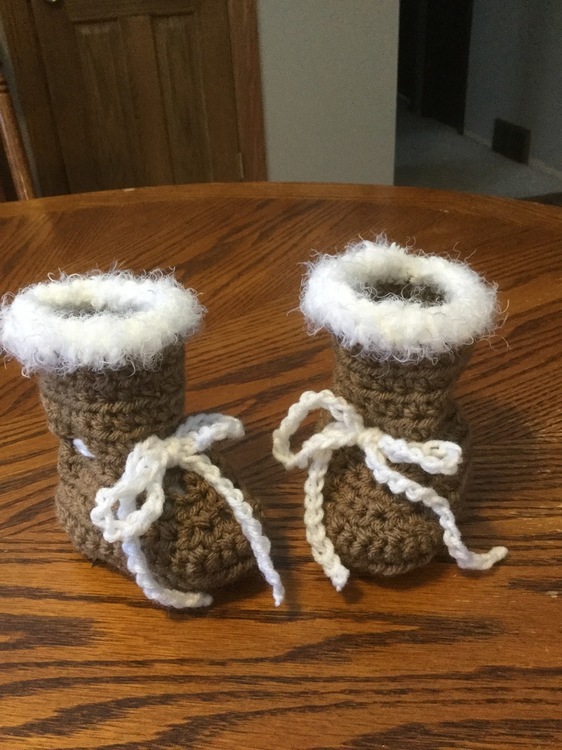 I saw a post on her Yahoo group that she has been able to do some very basic crocheting but she was quite hopeful and hoping for prayers for continued progress. Pneumonia is brutal anytime but how frustrating to have it at Christmas!!! Hope you get back on your feet soon. I'm about 3/4 through my first baby doll carrier and got the skirt done on an 18" doll outfit. I need to switch out the carrier with another project as working with 3 skeins of Red Heart SS is hard on my hands. So I do 5 rows carrier to 10 rows doll dress. If nothing else I'm making progress on multiple projects. When I'm done with the first carrier I'm going to detour to a gift project and substitute the gift for the carrier for a bit. When I'm done with my Valentine's package I'll come back and make the blanket for the carrier and get a start on the second one hopefully. Knocking those out early will hopefully leave the rest of the year open to complete other projects. I also found some Valentine's dishcloths I want to make that I found while pulling out patterns for the Valentine's package. 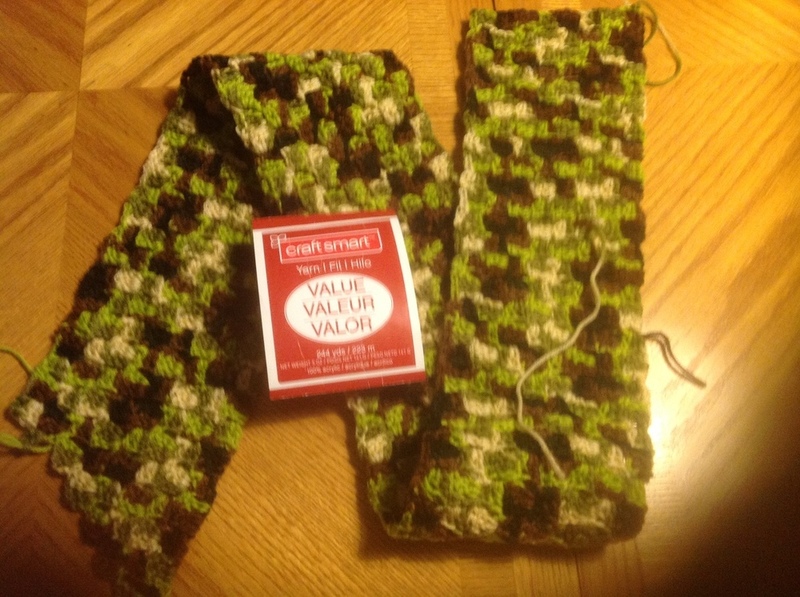 So here is the scarf I have been working on. I used a whole skein of Michael's store brand and only got 46". I'm sure I have another skein around somewhere so I can make it longer. The greens are not as bright as the picture. By the way Bailey, it was nice of your hubby to hunt down a few more dolls. You have a keeper!! I did manage to crochet about a row and a half on a baby blanket so I am hoping I can do something this year. even if I can only do a project a month I'll take it. Darski glad to see you check in. I haven't seen the My life in stores here but online the price seems slightly less expensive then the Our Generation dolls at Target. What are they like in terms of clothing fit? Darski, glad to hear you have been able to do a bit. You may not be able to make as many as you did in years past, but the items you do finish will be even more of a gift from your heart. Remember Darski you have lots of experience to help the rest of us, too. That row and a half sure is good news since you had given yourself that deadline! they have a huskier body type than any of the other 18" dolls of my acquaintance. Also a start on donations for the “Warmth for Warriors” mini Christmas stocking drive. Gardener the boots are ADORABLE!!! 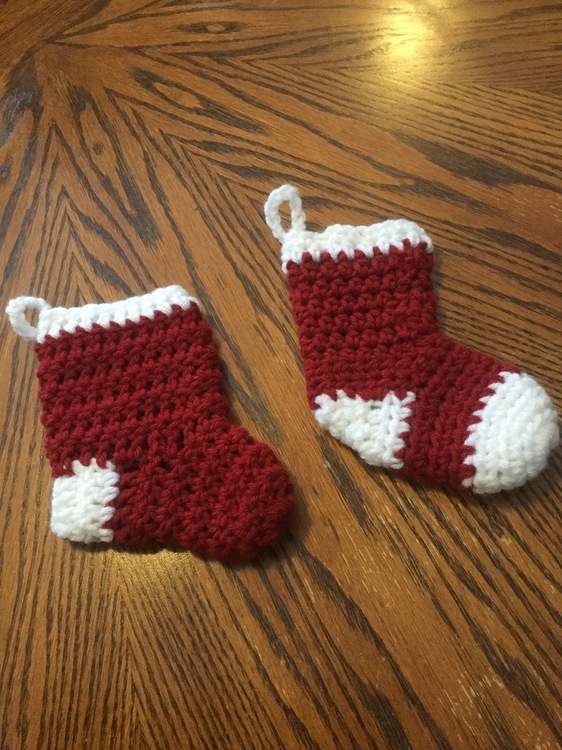 The stockings are cute and such a great cause. The first doll carrier got finished yesterday. I'll get pictures when the blanket is finished. I got 10 more rows done on the 18" doll outfit and with the combined New Year's Eve and Day work the doll carrier blanket seems to be close to half done. When I finish the blanket I plan to work on a Valentine package I need to ship. I will continue to offset one project with an 18" project to try to save my hands.